The Media Integrator brings design freedom to Joomla, for publishers, designers, developers who wish to trigger AJAX shadowbox pop-ups, with a variety media-types, including JW Player content. Users click the overlay element floated over any Joomla image (article or module). Integrated with JW Player 6. The MediaGration Media Integrator creates powerful and elegant AJAX-powered, media-rich sites; who want to place custom CSS overlays on top of images; capable of triggering shadowbox pop-ups that can deliver any Web-compatible content, including YouTube and JW Player videos, audio, images, documents, apps and external Web documents. The Media Integrator is - in fact - a CMS inside a CMS; greatly expanding the capabilities of Joomla's media manager. The Media Integrator allows Joomla publishers to place custom play overlays over any Joomla image, and link it to a media or Web target, inside of an AJAX shadowbox. The Media Integrator allows Joomla publishers to show thumbnails for every image on their Joomla site; to manage and assign CSS, mouse over sensitive CSS overlays, and assign mouse-over behavior and target URLs. The Media Integrator's Site Control Panel permits publishers to see all images associated with all articles, categories and entire site. 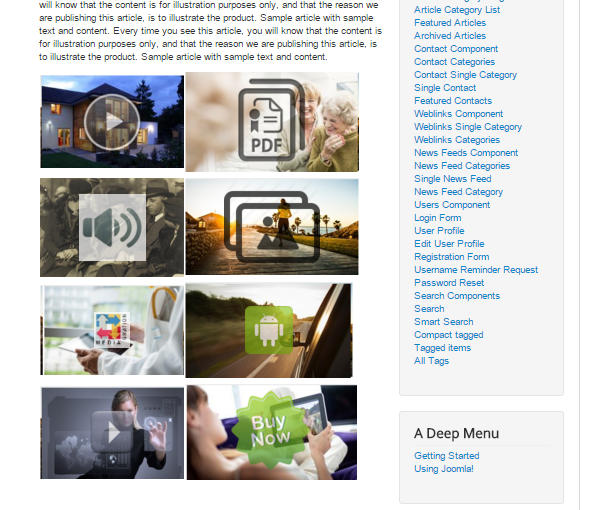 Publishers can place default or custom overlays over any image, and link it to media, application or external Web document, inside of an auto-wrapping AJAX shadowbox. See the screen shots and demo video below to understand how the Media Integrator turns a normal Joomla site into an AJAX-powered media portal. Click on the live demo site to see the Media Integrator in action. The below pop-up shows how the Media Integrator image looks to the Web visitor. The below screen shot shows how the Media Integrator can help design completely customizable user-interfaces. See a live demo of the below UX here.